The Methodist Church’s Collection of modern art on Christian themes was started almost sixty years ago, and now includes about 50 works by English and other international artists. It was the initiative in the early 1960s, of a Methodist layman, Dr. John Morel Gibbs, who believed that the quality of religious art and church furnishings was poor and hoped that an extensively exhibited collection would help draw attention to the situation and encourage a more imaginative approach to the commissioning and buying of painting, sculpture and church furnishings. Dr. John Morel Gibbs was aware that Rev. Douglas Wollen, regularly wrote about art exhibitions and collections for The Times and invited him to create the collection of contemporary religious works of art. Wollen began this work 1962, being largely responsible for the nature of the collection and the artists included. He proceeded to procure works by artists including Georges Rouault, Graham Sutherland, Patrick Heron and Elisabeth Frink amongst others. 18 November, 2.30pm: Methodist Modern Art Collection walk through with Eamon Maille. 25 November, 2.30pm: Faith, Imagination and Modern Art: An Introduction. 5 December, 5.30pm: Christ comes in a January Flower: Advent and Christmas as seen in the Methodist Modern Art Collection. 15 December, 12pm: From Annunciation to Nativity, A Walk and Talk Tour with Eimear Walshe. For further information, see http://methodistartdublin.ie/ HERE. 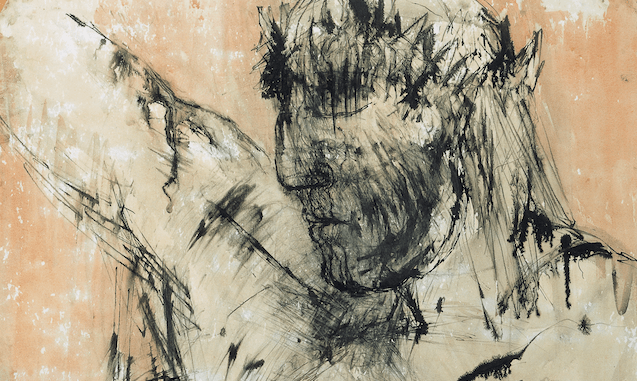 Image: Elisabeth Frink (1930-1993), Drawing (detail), 1956, 85 x 68 cm, Methodist Modern Art Collection, Image Copyright © Trustees for Methodist Church Purposes.